•How crowdsourcing can help you to efficiently and effectively manage discovery risk and confidentiality; and more. Peter Vanderheyden is COO of RWS IP Research where he brings over 30 years of experience across all business disciplines from finance to product management and entrepreneurial startups. 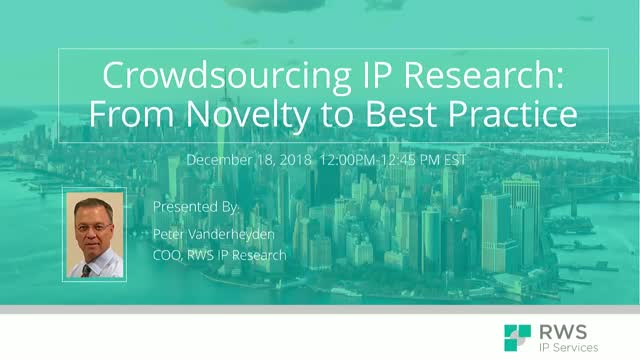 Prior to joining RWS, Mr. Vanderheyden was the Chief Executive Officer of Article One Partners where he led a team that developed AOP Connect and helped revolutionize the way that IP research is conducted through crowdsourcing. While vice president and Managing Director of LexisNexis’s Global IP Solutions, his team developed both TotalPatent and PatentOptiimizer, while spearheading the first truly semantic search engine for technical/patent content. Mr. Vanderheyden earned a BS in Business from the University of Minnesota with undergrad certification in math, science and engineering. Mr. Vanderheyden also has a US Patent to his credit.